Babington Technology, Inc. is a global operation with its central design, production and warehousing facility located on 8.5 acres in a 125,000 square foot complex in Rocky Mount, NC. We also maintain assembly operations in Maryland and have offices in Northern Virginia, Florida and Göteborg, Sweden. As a certified federal contractor, Babington Technology, Inc. utilizes state of the art design, engineering, fabrication and machining equipment. This extensive range of in-house capabilities enables Babington Technology to handle everything from high volume/high tolerance productions to the most intricate custom projects. For over 45 years Babington Technology has been committed to delivering the best value through innovative heating and cooking equipment products, services and new technologies. Babington Technology is indeed a full-service original equipment manufacturer and federal government contractor, providing technical service and logistical support all along the value chain – and to the end-user customer – throughout the entire product life cycle. To meet ever-changing customer and mil-spec requirements, Babington Technology deploys a federal contracting-approved manufacturing system that drives efficiencies, increases capabilities and lowers total cost of production. In 2009 Babington Technology increased its plant flexibility with the successful completion of multi-year certified technical and cost audits conducted by the Defense Contract Management Agency (DCMA) and Defense Contract Audit Agency (DCAA). Since then, Babington Technology has rolled out a single manufacturing system based on best practices and improved investment efficiency. In 2006, Babington Technology made a critical business decision: control the complete production and assembly of all Babington products inside its own facility. That decision dictated the need for state of the art machining and metal fabrication equipment along with the talents of a highly skilled labor pool. 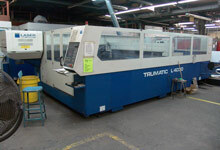 Babington Technology's Trumpf Trumatic L4030 laser cutting center handles a variety of cutting tasks ranging from precision cuts to ½" stainless steel. The Trumpf Laser includes a quick-change pallet and 4,000 watt resonator making complex fabrications easy. The Trumpf provides significant flexibility in product design, structural stiffness, and formability. It also makes possible the use of different materials in one component, weight savings and cost reduction in materials, scrap, equipment, assembly and labor. Babington Technology employs computer controlled (CNC) Lathe Turning and Vertical Machining Centers for both its manufacturing and rapid prototyping operations. 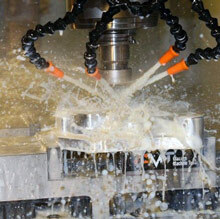 Haas CNC machining systems provide high-productivity solutions for custom machined parts. The 5-axis Haas VF5B-40 mill and SL30T lathe systems also provide flexibility and versatility in the production of critical DoD and DLA distributed parts. This helps support logistics and Reliability Centered Maintenance programs such as the USMC's RCM program for the Babington Airtronic burner and the US Army's Assault Kitchen (AK). The CNC capability was the first tool of choice for Babington Technology's plans to ramp up and build a rapid production capability for the Babington Airtronic burner to meet increased demand. The company now has the dimensional accuracy to produce any part in-house or adapt to any product improvements or design variations in a fraction of the time it used to take. The Haas systems continue to play a critical role in the quality control and process improvement of Babington Airtronic burner parts and Babington heating appliances. The 5-axis mil has the power to cut alloy steels for proprietary griddle tops as well as stainless steels, cast iron and high-nickel alloys. It also provides the flexible speed adjustment to machine the complex fireboxes that are installed in Babington Technology proprietary heat exchangers. Working closely with government agencies, Babington Technology has been able to dramatically reduce the machine and labor time for complex parts machining, fabrication, product testing and final assembly. By centralizing operations in-house, we are able to dramatically reduce machine time and improve quality control. The resultant savings are passed on to the US Government. In 2010, supply chain dependencies were reduced by over 65% for Airtronic burner machined parts. We are committed to continuing this trend with our Government partners. As we bring on new production and R&D capabilities, we are expanding the use of common manufacturing processes and standard systems to continue to drive cost out of the supply chain and improve overall plant efficiency. At the heart of Babington Technology is our product development and advanced research and development operations. Computer-aided-design (CAD) allows the development of three-dimensional (3D) designs from which conventional two-dimensional views can be produced. 3D CAD solutions like Autodesk’s Inventor and SolidWorks are two of the virtual tools used by our product development and manufacturing engineers. These software design solutions offer a comprehensive and flexible set of 3D mechanical design, product simulation, tooling creation and design communication programs. These programs enhance digital prototyping for advanced Babington Technology heating and food service equipment products. They also expedite the design process, reduce development costs and get products to market faster. We follow a straightforward practice in prototyping operations: produce a single working prototype of a designed part or system before the allocation of large amounts of capital to new production facilities or assembly lines. 3D modeling greatly supports the prototyping process. At Babington, manufacturing tool paths are also generated from 3D models, and in the development of advanced combustion burners, parts are created directly from a 3D database by using a rapid-prototyping and manufacturing method called stereolithography. This additive rapid-prototyping process builds physical parts in layers after a 3D model performs shape verification of a final component or part. After construction of the part is completed, it’s ready for testing in the final prototype. We have expanded the use of virtual tools and 3D modeling that simulate how advanced combustion equipment and mobile field kitchens are assembled. The goal here is to dramatically reduce the lead-time from receiving a direct customer requirement to fulfilling hardware deliverables. Since 2006 Babington Technology has reduced the number of manufacturing build issues on all heating appliance products and burner systems by more than 75%. We survey our customer's landscape where we can make a contribution. Then we spend our own time and money coming up with a technical solution..
Our software design solutions can expedite your design process, reduce your development costs and get your products to market faster.